Though I studied Indian culture before arriving, no amount of reading or advice could have prepare me for what I would experience.I was ready to come to the “Source.” The motherland that embodies many of the philosophies I identify with, my favorite foods, colors, vibrating faith, and a deep complex history. I couldn’t imagine how it functioned in practice. In my first week I was unsure of how to navigate being so glaringly white, tall, and conspicuous. I wanted to be invisible, watching life in India; how meals were eaten, how religions were practiced, how to cross a street lurching with dangerous traffic. In the three weeks I spent traveling with my mother. We traveled to cities throughout the Southern Indian states of Karnataka, Tamil Nadu, and Kerala. We had a beautiful adventure, and I began to understand why my soul urged me to fly across the country at such a young age. It has been only a few weeks since I returned home, and I am already planning my next trip to the country. I saw India as a country functioning on philosophies that I have always been drawn to. But teenage years, and societal conditioning had made me lose sight of the brilliance of life outside of the Western world. I now know why I adore this culture. I adore the speed, tempered by patience. I adore the frugal nature and innovation using available local and natural resources. I love the variety of smells and the intricate patterns of Kolam drawn in colored rice flour on sidewalks. I love the saris and lungis, spirited garments worn by most Indian people. There is a new kindness I hadn’t known. A curiosity and spirit stronger than any of the New Age hubs of America. I love the tradition and culture of India that has not been lost, cannot be shaken by Westernization. While my sensitive and sympathetic self can feel overwhelmed by the constant honking, the trash in the ocean, or the abandoned children found in railway stations, my love is not deterred. This is life. It is not all beautiful. I will return to India for an entire year in 2018. The only I plan I have is to wander. To meet my Indian friends again and to allow myself to surrender to love and the rhythm of the country. With great thanks to La Paz group for helping me navigate my first trip to India. 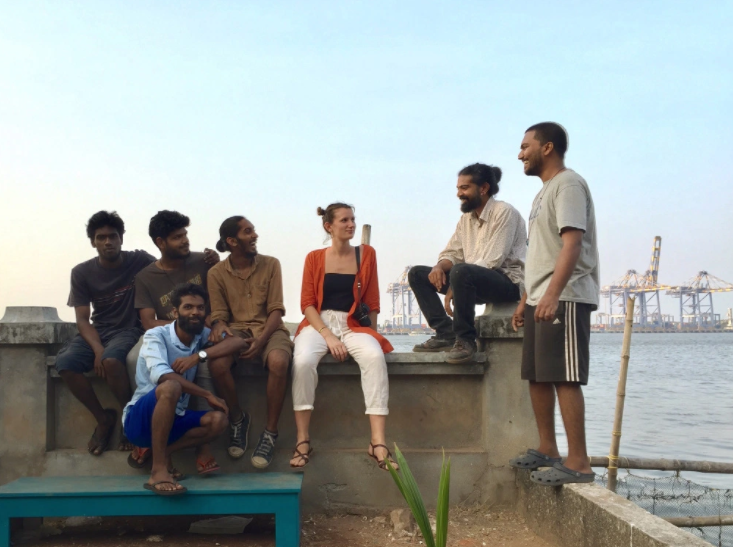 And for the opportunity to volunteer at the Kochi-Muziris Biennale – two weeks spent among Indian art students volunteers and international art and artists. Out of a window in the madras club. Locals clean up the debris of a cyclone that hit Chennai a few days before. Taking a break from moving logs and sticks. An employee of the Madras Club, with “master” John Davis, who has been going to the club since he was 20 years old. Photographed on a tea break, driving through Tamil Nadu. A tea trimmer, paid 300 rupees a day to clip the fresh leaves off the bush. She carries her clippings on her head. The tea valleys of Munnar. Seen in a Hindu temple. Fishermen in the back waters of Cochin. Volunteers closing the Pepper House Gallery space after a day of work. Babu. The maintenance man of The Pepper House. Myself and the volunteers of The Pepper House.